The only video of my readings that I’ve seen so far and liked was shot by Sze Ying Goh at No Black Tie, Kuala Lumpur on April 1 2007. You can find this video in the ‘Narc Is I’ section of this blog. In it, I am reading “Karna Considers Yuanfen”. This was the first of the poems that reimagine the Mahabharata’s Karna as a woman and alter-ego, juxtaposing the epic character with personal history. When I first wrote it, I was not sure — it is a prose poem, clunky with text, drenched in heavy imagery. I did not think it could translate to the stage. But I found, repeatedly, that it was among my most popular works, the kind in which the audience stays silent for a moment after it ends before they begin to clap. Although there are other poems outside of this trilogy, “Karna Considers Yuanfen” leads into “Karna Considers Light” and “Karna and Kunti”, neither of which have been published before. The former is a rumination on the nature of Karna’s relationship to her omniscient, unattainable father, the god of the sun, the latter a more traditional retelling of her encounter with her unknown mother on the battlefield. In the first poem, the closing lines are engraved on a plaque in the crypt of the astronomer John Brashear; the second contains a phrase from Ainkurunuru 13 (trans. Ramanujan). I realise my poems and blog have niche audiences who are probably already familiar, but Yuanfen is the Chinese concept of the apportionment of love one is destined to have in one’s lifetime. All three are published in the April issue of Kritya. Click on the “more poems by SM” link there to take you to the second and third. Why is Karna a woman, and why have I chosen this character to explore biomythography? Because the story of Karna is the story of why art has any meaning to me. It was the first story I ever heard that devastated me, that taught me immediately of both the power and pathos of storytelling and shaped my moral universe as a very young child. Karna is my mythological archetype, and the deeper I delved into creating my own art, the more I wanted to appropriate this story in a way that was truly mine. Karna’s story is truly one of the most heart-rending in all of Hindu mythology, excepting perhaps of Eklavya. Karna has been my favorite as well ever since I was a child, and shed my first tears for him when my grandma recited me the Mahabharata. Hello Sharanya… I saw this poem in your chapbook. Is it the same one? F. — Yes, it was published in Iyari in 2006. There is always this unique sense of attachment towards Karna. I have noticed this with many people. He can effuse that unknown sentimentality in you!!!! I’ve always been a fan of the Yuanfen poem of yours, and now I find this Karna considers Kunti even more evocatively beautiful! I think it is one of those poems that beg to be read out – aloud. There is, as you point out a primitive chord of pathos and pain in Karna’s tale. Damyantig & Praveen — Yes, in many ways Karna is the Mahabharata’s real hero. The tragedy of his life is what really gives the epic its power: because it is about love, neglect and betrayal, it’s a tragedy that more people can relate to than, say, the tragedy of being exiled or losing one’s kingdom. Vidya — Thanks! One of the things I enjoy when reading “Karna and Kunti” aloud is to enunciate the double entendre in the phrase “warrior sun”. It evokes Karna’s father in the intended meaning, and when said aloud sounds like “son”, like an inside joke. stress it with a few R’s. Hi Sharanya, i’ve seen your reading of the poem before…definitely one of my favourites I saw an award winning movie in Malayalam called Vaanaprastham…one of the central characters is this woman who is obsessed by the character of Arjuna. 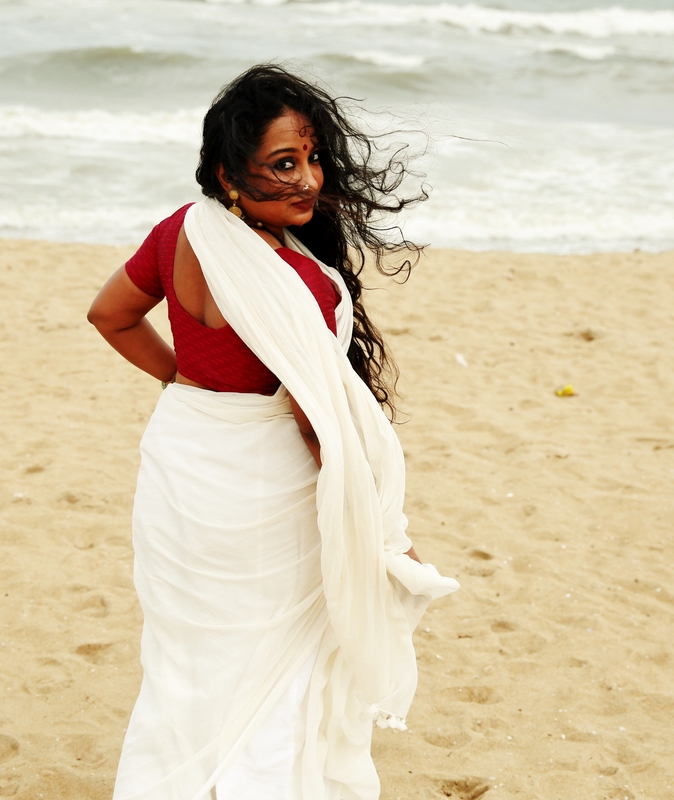 She falls in love with the Arjuna portrayed by a kathakali artiste, not with the man behind the character. She yearns to make love to Arjuna, the hero – the embodiment of virility, and bear his son. I quite enjoyed the movie and Mohanlal’s national award winning role as the kathakali artiste. You should watch it.